App powered by Sabre, Yelp!, Google APIs and a social media user experience wins challenge to build innovative online and mobile software capabilities that reinvent travel e-commerce. 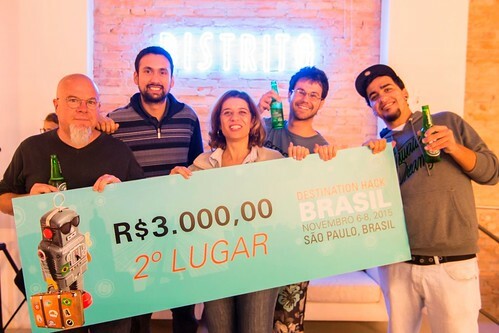 São Paulo, Nov. 12, 2015 -- Sabre Corporation SABR, -1.29% the leading technology provider to the global travel industry, announced the winners of its first travel hackathon held in the Latin America region, based on their creative use of API technology and open developer platform powered by Sabre Dev Studio. 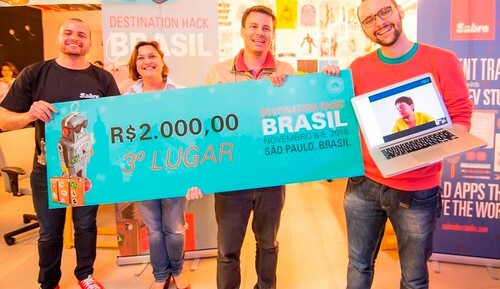 DestinationHack Brazil was featured as the only travel technology contest during Sao Paulo Tech Week, a regional event focused on innovation and entrepreneurship. across platforms and devices, and to explore business opportunities as startup entrants to the industry. All finalist apps and websites prototypes were built in response to three key challenges: inspire travelers to visit Brazil, create a seamless and mobile travel experience at the Rio 2016 Olympics, and think of outside-the-box ways to monetize travel and drive new business for agents, tour operators and corporate buyers. The winner of the first grand prize, Travll, is an app that helps users to plan trips in a fun way and without the need to visit tens of external websites such as blogs, review sites, or social media. Travll was built using a Node.JS server that interacts with Sabre APIs, Yelp!, Google APIs and the Android OS. The winning app was created by Mauricio Giordano, Full Stack developer student of IT systems at USP Sao Carlos, and Bruno Lemos, co-founder of InEvent and student of computer engineering at USP Sao Carlos. Their app was rewarded a first prize of 5,000 Reais, and a six month lease contract in the Distrito venture campus to run their startup. "It was the most amazing app we've done in a 24-hour hackathon," said the team. Winners in each category were elected by a panel of industry experts: Andre Freller (VP, technology at Reserva Facil), Marcio Chaer (Co-Founder at Rock Innovation), Artur Andrade (Chief Editor, Panrotas publishing), Ricardo Freire (Founder, Viajenaviagem.com), and Felix Rode (Director, Technology and Innovation at Argo IT). The apps ideas were evaluated based on their technical quality, design and user experience, potential to reinvent the travel ecosystem, and best utilization of Sabre APIs. "It was amazing to see many exceptional quality ideas within just 24 hours, witnessing developers' restless enthusiasm to create innovative apps that can empower the travel industry," said Luiz Ambar, vice president of Sabre in Brazil and southern Latin America. "Our panel of judges, each of them an influential expert in the many aspects of the travel industry, chose Travll as the first Destination Hack Brazil winner app as it brings an innovative and engaging approach to how consumers expect to shop and book travel in a dynamic and highly personalized way." "Their creativity was such that they leveraged the best API technology provided by Sabre and other leading technology companies, with the same approach to a seamless multi-device experience Sabre takes for our core software solutions for travel," Ambar said. 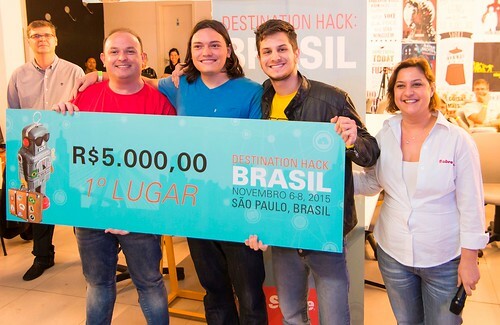 As partner sponsor of DestinationHack, Brazilian technology provider Argo IT also recognized TravelAnalytics as the app with most potential in business development, with a special prize of 5,000 Reais and a 2-month mentoring program from Argo IT to support their entrepreneurship by sharing expertise in corporate travel and e-commerce solutions. TravelAnalytics, a web platform created by Andre Wilson (computing science and PhD business management), Caio Oliveira (IT architecture and development) and Robert Willian Gil (software development and analysis), provides a comprehensive dashboard to analyze the highly competitive and complex events management market, for either corporate or leisure travel. The app also delivers an outlook for travel demand. 2 [nd] Sabre Prize - 3,000 Reais and a 3-month lease contract with Distrito venture campus – Awarded to GottAGuide, a mobile and web platform that connects travelers to professional tour guides to further personalize their online shopping. GottaGuide, developed with a focus to drive inbound tourism, was created by Gillian Arruda, Rafael Saraceni, Lucas Villarreal and Pedro Senise. 3 [rd] Sabre prize – 2,000 Reais – Awarded to TravelAnalytics. VoyenBus People's Choice – round-trip bus tickets Sao Paulo to Rio de Janeiro – Awarded to Travll. Sabre's #DestinationHack in Sao Paulo has resulted in a technology incubation event showcasing a broad number of new applications that have the potential to change the travel experience, with special mention to: Cremer as an aggregator for corporate travel, mobile app Itairu that helps travelers to explore in-destination services while driving leads to agencies, Mee#z to create events within major gatherings for sports or live concerts, CaraVamo to connect travelers based on profiles and trip themes, SocialTrip to inspire destinations and provide airfares based on "Likes" and "Follows", Wr2Go as an interactive photo gallery enabling behavioral shopping and analytics, and SmartMatch as an online booking platform that connects travelers with shared interests. Developers were invited to use more than 150 application programming interfaces (APIs) available in Sabre Dev Studio, Sabre's industry-first open platform providing IT developers with immediate access to a sandbox, sample code documentation, prototypes and demos.